Hi FunGoPlayers! Gnarly Tinkles here. Today I wanted to tell you about one of my favorite pitches of all time, Greg Maddux. 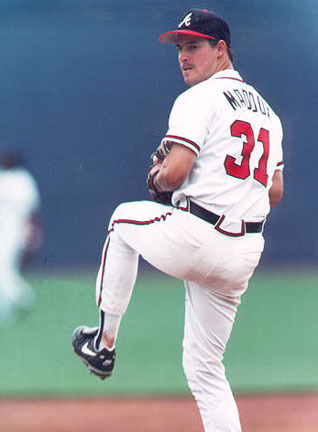 While famous pitchers like Nolan Ryan and Roger Clemens relied on a powerful fastball to strike out opposing batters, Maddux was the king of technique. From 1986-2008, Maddux worked over batters like toys, commanding many different types of pitches and was a master of painting the strike zone. He is most famous for his stints with the Chicago Cubs (’86-’92, ’04-’06) and the Atlanta Braves (’93-’03) – his number (#31) is now retired with both teams. WOW! And who said finesse couldn’t win out over power? Thank you for reading about one of my favorite pitchers! If you have a favorite athlete you’d like me to write about, please let us know on the FunGoPlay Forum! Posted by fungoplay on September 23, 2011 in Sports and tagged all-star, baseball, flashback friday, greg maddux, legend, mlb.